(Nanowerk News) Microfluidic products expert Dolomite has launched Mitos Dropix, an ingenious droplet-on-demand system capable of easily generating extremely miniaturised droplet compartments with exceptional control over volume, environment and isolation of contents. Dolomite's novel Mitos Dropix system. Meeting the increasing demand for screening massive numbers of biological reactions, increased speed of screening and reduced reagent consumption, Mitos Dropix technology now introduces liquid sampling and processing over a very wide 10 nL – 50 µL volume range utilizing droplet technology. Mitos Dropix will be invaluable to application areas such as droplet library creation, cell encapsulation, diagnosis screening, synthetic chemistry and drug bioassays, as well as being applicable to high-throughput screening formats. 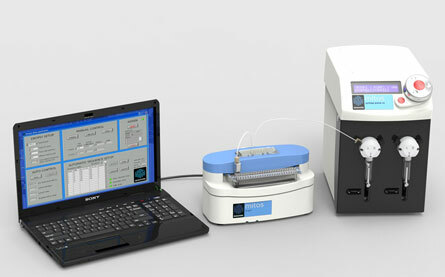 Mitos Dropix is a compact, off-chip droplet generator that features a patented droplet “picking” technology. It was developed by Dolomite under exclusive sub-licence with Drop-Tech Ltd. having won Dolomite’s 2012 Productizing Science® competition. Drop-Tech was formed from an academic collaboration between Cambridge University and Imperial College London and is the exclusive licensee of their patented droplet generation technology used in Mitos Dropix (Patent Pending: PCT/GB2013/051668). There are 24 wells in total, allowing users to combine multiple reagents to create complex assays, resulting in up to 300 combinations. 8 Dropix Sample Strips can also be inserted into the Dropix Sample Strip Holder thereby creating a 192 well plate configuration which facilitates preparation and allows integration with existing standard fluid handling systems. Mitos Dropix is capable of consistently generating and storing up to 1000 droplets, with accurate user-defined control of droplet size (ranging in volume from a few 10’s of nanoliters to a microliter) and frequency (up to 5Hz of one sample) achieved via Dropix PC software.